The Zimbra Collaboration suit is more than just email, it provides a rich set of email, calendar, contacts, IM, and documents, with full cross-platform support. Native integration on Windows, Macs, and Linux desktops allows everyone to be productive. For organizations with heterogeneous end-user base, Zimbra could be the best mailing solution. Zimbra can be configured on External and internal servers in order to serve mails to the users with or without internet access in the organization. The local server connects with the remote server to fetch mails from the remote server which serves the users without internet access. Contacts can be centralized from the desktop and mobile devices all in Zimbra and easily managed within Zimbra’s web address book. Zimbra’s personal and group calendar offers advanced scheduling and free-busy times with drag and drop functionality. Any application or file from your Briefcase can be quickly shared with peers inside or out of your organization. With a few simple clicks any file you need is always at your fingertips in the office, home or on the road. Zimlets are a framework for integrating Zimbra’s web email and collaboration experience with third party data sources to create new “mash-up” user interfaces or brand new application Tabs. They save end users time by condensing common tasks, which typically force them to open multiple applications, into simple contextual ones within Zimbra. Zimbra ships with a default of Zimlets on the server plus new ones can be easily created and deployed by customers to integrate Zimbra with back office systems or custom workflows. Zimbra has developed a Unified Messaging Zimlet that allows users to quickly launch calls, conference calls and to access voice mail from within the Zimbra Collaboration Suite. Zimbra’s Unified Messaging Zimlet leverages the SIP protocol, an open standards based protocol, thereby providing Zimbra’s customers will have the maximum choice of VoIP providers. The initial offering of Zimbra Unified Messaging is based on a partnership with Asterisk, the leading open source VoIP provider. Mobility: Zimbra allows integration with all smart phones and Blackberry devices. Users can access ZCS using BlackBerry mobile devices as ZCB is a plug-in that enables synchronization. i2k2 Networks Provide 100% managed services for Zimbra Collaboration Suit hosting. 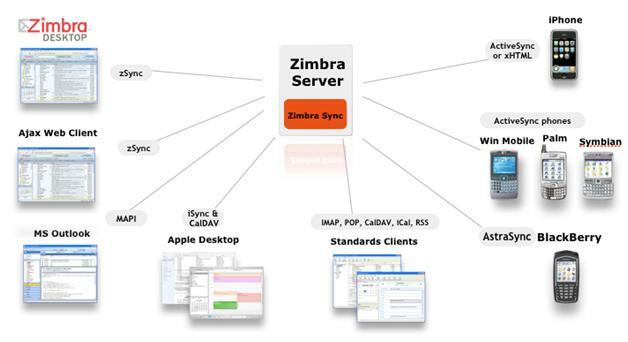 Zimbra OSS version is free to download and use. There is no licensing cost involved for using the application. Not only this, but also, all the updates for Zimbra OSS version are provided free of cost hence, total cost of ownership (TCO) while meeting all requirements is very less for Zimbra as compared to any other solutions. The ZCS natively includes Spam Assassin and the DSPAM filter for spam protection (can be turned on/off). There is no hidden licensing involved for any Anti Virus / Anti Spam.